Sidney Abel was born in Salisbury, Wiltshire in 1871, the son of Jane Webb and Arthur Abel, a painter and former shoemaker. Arthur Abel (c1832-1879) married Jane Webb (born 1827, Rockbourne, Hampshire) in 1855 and this union produced at least 6 children, the youngest of which was Sidney Abel, who was born during the 4th Quarter of 1871. When Sidney Abel's father died in 1879, 8 year old Sidney was living in Salisbury, Wiltshire, with his mother and surviving siblings. (Two brothers had died young, pre-deceasing their father). Mrs Jane Abel's eldest daughter, Louisa Jane Abel (born 1855) was obliged to leave home and go into domestic service. 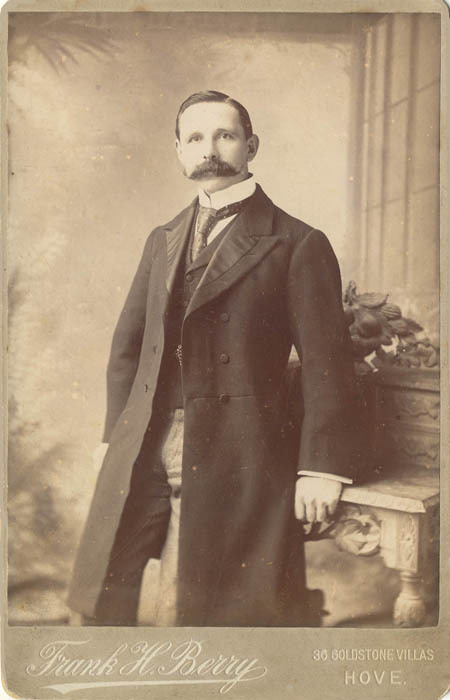 William Arthur Abel (born 1861), Sidney's eldest surviving brother, found work as a shop assistant and an older sister, Alice Kate Abel (born 1864) was apprenticed to a dressmaker. When it was Sidney Abel's turn to find full-time employment, he joined a Salisbury photographic firm. When the 1891 census was taken, Sidney Abel was residing with his widowed mother, sixty-four year old Mrs Jane Abel at a house in Fowlers Road, Wiltshire. 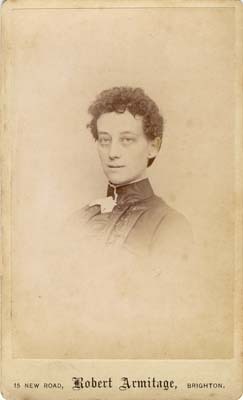 Sidney's eldest sister, Louisa Abel, who was 34 years of age and unmarried, had returned to live with her mother and brother. On the 1891 census return, Sidney Abel is described as a 19 year old "Photographic Printer". 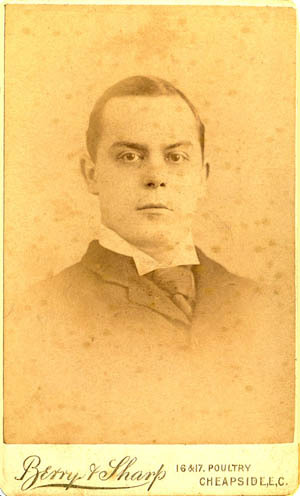 By 1895, Sidney Abel was in Brighton. During the First Quarter of 1895, Sidney Abel married Mary Eliza Lewis (born 1873, Brighton). The following year, Mrs Mary Eliza Abel gave birth to a son named Sidney Arthur Abel (birth registered in Brighton during the 1st Quarter of 1896). When Frederick Cecil Abel, Sidney and Mary's second son, was born early in 1898, Sidney Abel and his family were residing in Hurstpierpoint, Sussex. Given his work experience as a photographic printer it is possible that Sidney Abel tried to earn his living as a photographer when he first arrived in Sussex, but when the 1901 census was taken he was working as an "Insurance Agent". At the time of the 1901 census, twenty-nine year old Sidney Abel, his wife Mary and their two sons, five year old Sidney junior and three year old Frederick, were residing at 121 Cowper Street, Aldrington, Hove. (Now part of the 'Poet's Corner' area of Hove). Around 1904, Sidney Abel and his family moved to a street of newly built houses in Kendal Road on the western fringes of Hove, not far from Dyke Junction Railway Station (now known as Aldrington Station). The 1905 edition of Kelly's Directory of Sussex records Sidney Abel as a photographer at 19 Kendal Street, Hove. Abel's period of activity as a photographer in Hove was brief. Towner's Directory of "Brighton and Hove Professions and Trades", published in 1906, does not mention the name of Sidney Abel in the list of 'Photographic Artists" and his name is also missing from the list of 'Photographers' in Kelly's Directory of Sussex, issued in the following year. Sidney Abel moved to Coventry, Warwickshire, to continue his photographic career. When he completed the census return form for 92 Widdrington Road, Coventry, in April, 1911, Sidney Abel stated that his profession or occupation was "Photographer ('own account')" and that he was working from his home address. Fifteen year old Sidney Arthur Abel, Sidney's eldest son, was employed as a "Draughtsman's Tracer" in a Motor Cycle works, while 13 year old Frederick Abel was still attending school. Sidney and Mary Abel must have been living in Coventry since at least 1909, as the birth of a daughter named Nellie May Abel was registered in Coventry during the 2nd Quarter of 1909. Sidney Abel was still residing at 92 Widdrington Road, Coventry, when his youngest son died in June 1917. Sidney Abel, photographer of Hove and Coventry, died at the Coventry & Warwickshire Hospital in Keresley, Warwickshire, on 10th June 1954, aged 82. [ABOVE] When he was working as a photographer, Sidney Abel was based at 19 Kendal Road in the Aldrington district of Hove. 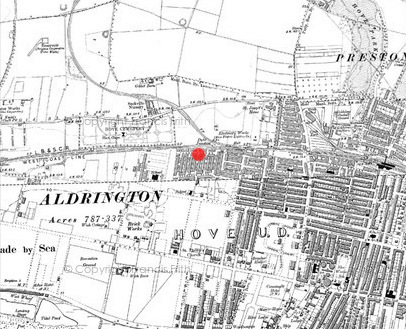 As this Late Victorian map shows, Aldrington was a westward extension of Hove. [ABOVE] Sidney Abel listed as a professional photographer at 19 Kendal Road, Hove, in the commercial section of the 1905 edition of Kelly's Directory of Sussex. Sidney Arthur Abel (1896-1916) eldest son of the photographer Sidney Abel. Both of Sidney Abel's sons died during the First World War. Pioneer Sidney Arthur Abel [LEFT] of the Royal Engineers was asphyxiated after a gas attack on the Somme on 26th June 1916 when he was 20 years of age. Nineteen year old Private Frederick Abel of the 9th Battalion, Cheshire Regiment, died on 20th June 1917 from wounds received during the Battle of Messines Ridge. Sidney Abel's surviving child, Nellie May Abel (1909-1980) married Leonard Hartsilver, an automobile engineer, in 1930. The Academy Art Studio Company was a photographic firm which was based at 126 Church Road, Hove, between 1909 and 1911. The 1909 edition of W. T. Pike's Brighton and Hove Directory and Blue Book records the Academy Art Studio at 126 Church Road, Hove, under the heading of 'Photographers' in the trade and commercial section of the directory. 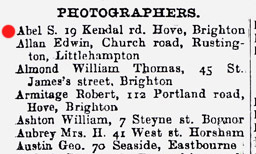 The 1909 edition of Kelly's Directory of Sussex does not include the Academy Art Studio in its list of 'Photographers', but it does record a Mrs Selina Goodchild as a 'photographer' at 126 Church Road, Hove, so I presume she was either the owner or manager of the photographic studio at 126 Church Road, Hove. 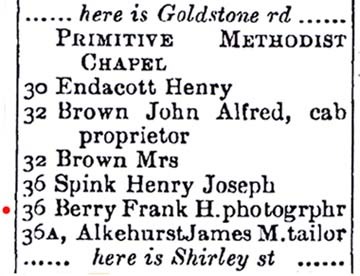 In 1910, Pike's Brighton and Hove Directory again lists the Academy Art Studio Company in its list of 'Photographers', but the same directory lists a "C. Goodchild" as a photographer at 126 Church Road, Hove. Mrs Selina Goodchild, who is listed as a 'photographer' at 126 Church Road, Hove, in 1909, was at this time a widow in her mid-thirties. She was born Selina Heryet in Brighton on 28th September 1873, the daughter of Ann and John Heryet, a horse's groom and coachman. On 20th July 1899, 25 year old Selina Heryet married John Goodchild (1869-1908), a market gardener from Kent. John Goodchild's father, John Goodchild senior (1847-1928) was a fruit grower who ran a public house (The Woodman) in Farnborough, Kent. After his marriage to Selina Heryet, John Goodchild junior became the licensee of the British Queen Inn at Locks Bottom, near Farnborough. Over the next 8 years, Mrs Selina Goodchild gave birth to 4 children, but two boys died in infancy and only Constance Louise Goodchild (born 1900) and Hilda Selina Goodchild (born 1904) would survive childhood. On 25th February 1908, John Goodchild junior, Selina's husband, died at the age of 38. Mrs Selina Goodchild left the Farnborough area and together with her two daughters, 8 year old Constance and 4 year old Hilda, returned to her parents John and Ann Heryet, who were now living in Hove, Sussex. Within a year, Mrs Selina Goodchild set herself up as a photographer and joined the Academy Art Studio Company at 126 Church Road, Hove. Some time before April 1911, the photographic studio at 126 Church Road, Hove was closed and by 1915 the business premises at No. 126 was being used as a hairdresser's shop. 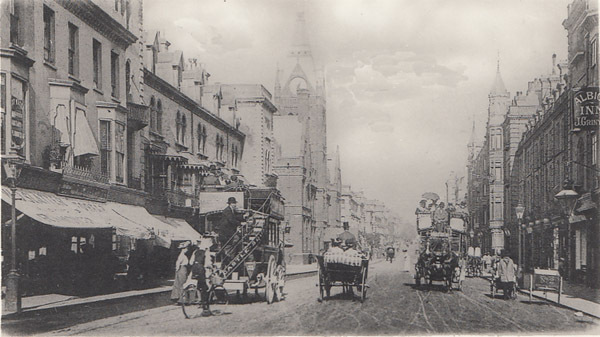 [ABOVE] Church Road, Hove as depicted in a postcard produced by the Mezzotint Company around 1905. In the centre of the picture is Hove's Old Town Hall. 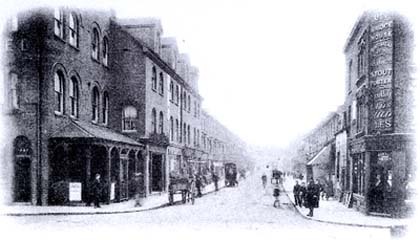 On the far left of the picture is William Slatter's ironmonger's shop at 123 Church Road. On the far right of the picture is the Albion Inn (Publican: John Grinyer) at 110 Church Road. 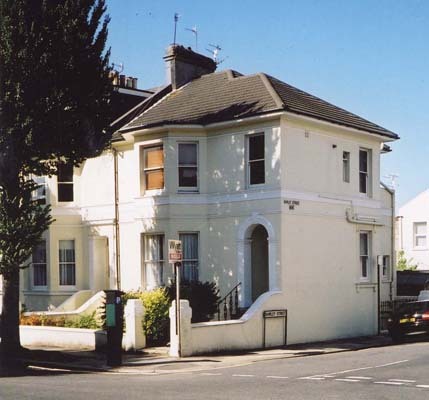 The Academy Art Studio Company was located on this side of the road at 126 Church Road, Hove. Robert Armitage, who was born in Lewes in 1858, was the youngest son of Sarah Scutt (born c1817, Shipley, Sussex) and John Armitage (born c1816, Horsham, Sussex), a harness maker and saddler of Lewes. On 10th March 1839, Robert's father, John Armitage, had married Sarah Scutt in her home village of Shipley in West Sussex. John and Sarah Armitage initially settled in Horsham, Sussex, where two of their children were born. [John Armitage junior was born in Horsham in 1843 and a baby daughter, Jane Armitage, arrived two years later]. By 1847, John Armitage and his family were living in Lewes. Between 1847 and 1864, Mrs Sarah Armitage gave birth to another 7 children - Henry (born 1847), William (born 1850), Thomas (born 1853), Charles (born 1855), Robert (born 1858), Fanny Ellen (born 1860) and Alice Armitage (born 1864). When the 1871 census was taken, 12 year old schoolboy Robert Armitage was living with his parents and siblings at 18 St Mary's Lane, Lewes. Robert's father, 55 year old John Armitage is described on the census return as a "Saddler, etc." employing two men and one boy - namely, his three sons: Henry (23), William (21) and Charles (15). Robert Armitage chose not to follow his father and brothers in earning his living as a saddler or harness maker. By 1881, Robert Armitage was residing in Brighton and working as a "Photographic Printer". The 1881 Census records Robert Armitage as a twenty-two year old "Photographic Printer" boarding with Frederick Nye and his sister, Catherine Nye, at 36 Islingword Road, Brighton. When the census was taken, Robert Armitage was probably employed at one of the many photographic studios that were in business in 1881. (At this time, there were over 30 photographic studios in Brighton). Around 1888, Robert Armitage decided to set up his own photographic studio in Brighton. The 1889 edition of Pike's Directory of Brighton & Hove lists Robert Armitage as a professional photographer at 15 New Road, Brighton, a studio which had just been vacated by the photographer William Kessler (1859-1929). When the 1891 Census was taken, Robert Armitage was lodging at 21 St Peter's Street, Brighton. On the census return, Armitage is described as a 32 year old self-employed "Photographer". It appears that Armitage closed his photographic studio at 15 New Road in 1891. Evidence suggests that, in 1892 or 1893, Robert Armitage moved his photographic business to 13 St James's Street, Kemp Town, Brighton, which had been the site of a photographic studio since 1854. Around 1896, Robert Armitage moved to the district of Aldrington, an area which had been amalgamated with Hove a couple of years previously. After he moved to Aldrington, Robert Armitage opened a new studio at 112 Portland Road, Hove. 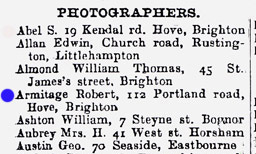 [The 1896 edition of Pike's Directory of Brighton and Hove lists Robert Armitage as a professional photographer at two addresses - 13 St James's Street, Brighton and 112 Portland Road, Hove]. By 1897, Armitage had closed his photographic studio in St James's Street and was operating solely from Portland Road. The district of Aldrington, where Portland Road was located, had been developed with new housing in the 1890s and in the ten years between 1891 and 1901, the population had trebled. The 1901 census records Robert Armitage as a single man of 42 lodging at 117 Wordsworth Street, Aldrington, Hove. On the census return, Robert Armitage is described as a "Photographer (own account)". Although he was living in Wordsworth Street, Armitage operated his photographic studio at 112 Portland Road in a parade of shops. 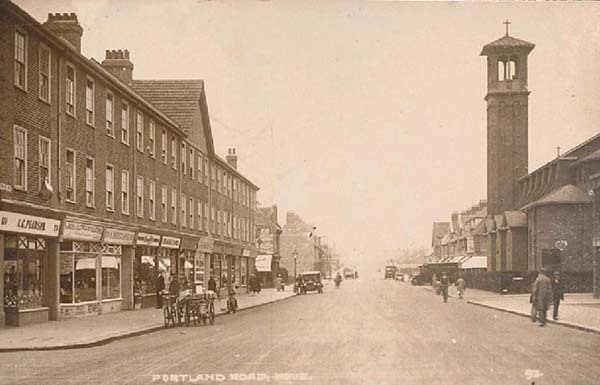 Portland Road was still being developed during the first decade of the twentieth century and so the numbering of buildings in the road changed between 1905 and 1911. When the building work was completed, Robert Armitage moved his lodgings from Wordsworth Street to Portland Road. By the time the 1911 census was taken, Robert Armitage was lodging with Mary and Charles May, a retired Royal Navy Warrant Officer, at No.110 Portland Road, Hove. Charles May had been running a stationery business at 110 Portland Road, but it appears from around 1910, Mr May let out his shop to his lodger Robert Armitage. On the 1911 census form, 52 year old Robert Armitage declared that he was a "Photographer & Portrait Painter (own account)" and that he was working from two rooms ("at home") at 110 Portland Road, Hove. Apparently, Robert Armitage ended his career as a professional photographer around 1912, as he is not listed as a photographer in local trade directories from 1913 onwards. There is a record of a Robert Armitage marrying Elizabeth Mary Harrison (born 1868, Battersea, Surrey) in the district of Steyning (which covered Hove) in 1918. Robert Armitage died in Hove in 1931 at the age of 73. [ABOVE] A portrait of an unknown woman photographed by Robert Armitage of 15 New Road, Brighton (c1890). Six years later, Robert Armitage was operating as a photographer in Portland Road, Hove. [ABOVE] A picture postcard of Portland Road, Hove (c1930). Robert Armitage opened his photographic studio at 112 Portland Road, Hove, in about 1896. It was in the year 1896 that the long, straight road that ran from the junction of Clarendon Villas and Sackville Road to Portslade Station was named Portland Road, after the Duke of Portland. In the early 1880s, Aldrington had consisted of fields, market gardens and brickfields, but in the 1890s the the area west of Sackville Road was developed with new residential housing. In 1881 the population of Aldrington numbered 144 people, yet by 1891 it had risen to 2,238. In 1901. the population of Aldrington had reached 6,840. 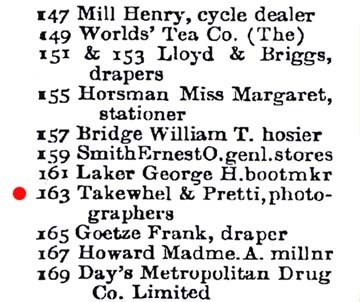 [ABOVE] Robert Armitage listed as photographer at 112 Portland Road, Hove, in the commercial section of the 1905 edition of Kelly's Directory of Sussex. The photographic studio at 42 Cowper Street, Hove, which went under the name of "E. Austin" for a brief period around 1905, was probably owned by Ernest Austin (1878-1909), who was possibly assisted by his younger brother Edward Austin (1883-1955). Both brothers were professional photographers and were living with their mother Mrs Lucy Austin (1852-1926) at 42 Cowper Street, Hove, in 1905. Ernest Austin was the eldest son of Lucy Grover (born 1952, Sompting, Sussex) and Jesse Austin (born 1850, Sompting, Sussex), a gardener and nurseryman. On 22nd February, 1873, Jesse Austin had married Lucy Grover, a domestic servant and a daughter of Lucy Lindup and William Grover, a labourer of Sompting. By 1878, Jesse Austin and his wife had moved to Connaught Road, Hove. The union of Jesse Austin and Lucy Grover produced at least 6 children - Ernest (born 1878, Hove), Jesse Austin (born 1881, Hove), Edward (born 1883, Hove), Harry (born 1885, Hove), Lucy (born 1887, Hove) and Oliver Austin (born 1893, Hove). By 1891, Jesse Austin senior and his family were residing at No. 3 Westbourne Place, Aldrington. On the 1891 census return, Jesse Austin senior is described as a self-employed "Nurseryman", while his eldest son, 12 year old Ernest Austin, was working as a "Page". During the 4th Quarter of 1895, Jesse Austin senior died at the age of 45. Jesse Austin's widow, Mrs Lucy Austin, together with her children, were obliged to occupy 4 rooms in a house shared with another family at 5 Westbourne Place, Aldrington, Hove. The 1901 census records twenty-two year old Ernest Austin and his eighteen year old brother Edward Austin both working as "photographic assistants". [According to Rendel Williams of the Sussex Postcards website, Edward Austin had been working as an assistant to the photographer and pioneer film-maker James Williamson (1855-1933) in Hove since 1898]. By 1905,Mrs Lucy Austin and her two photographer sons, Ernest and Edward Austin, were living at 42 Cowper Street, Hove. The 1905 edition of Kelly's Directory of Sussex lists Mrs Lucy Austin as the head of household at 42 Cowper Street, Hove. It was around this date that Ernest Austin and/or Edward Austin established a photographic portrait studio at 42 Cowper Street. Presumably, as the older brother, Ernest Austin (born 1878, Hove) was probably the senior partner and the name of the studio (i.e. E. Austin) therefore almost certainly refers to Ernest Austin. The photographic studio at 42 Cowper Street, Hove, was probably in business for only a year or so. The photographic studio at 42 Cowper Street was closed and around 1906 Mrs Austin moved to Manchester Street, where she rented out rooms. A year or so later, Mrs Austin (together with three of her sons, Ernest, Edward and Oliver) returned to Westbourne Place in Hove, occupying 6 rooms at No. 11. According to Rendel Williams of the Sussex Postcards website, Ernest Austin and Edward Austin established a stationery business at 11 Westbourne Place, Hove, and from 1906 the brothers started to produce photographic postcards from this address, marking their images with the initials "E. A.". A selection of the picture postcards produced by Ernest Austin or Edward Austin are featured on the Sussex Postcards website The business partnership between Ernest Austin and his younger brother Edward Austin was brief. In 1909, at the relatively young age of 30, Ernest Austin died. The stationery business and the publication of picture postcards was continued by Edward Austin. The 1911 census return for 11 Westbourne Place, Hove, records twenty-seven year old Edward Austin, a "Photographer" working "at home" on his "own account" as the "Head of the Family". Sharing the accommodation at 11 Westbourne Place, Hove, was Edward Austin's widowed mother, 59 year old Mrs Lucy Austin, and his younger brother Oliver Austin, a 17 year old employed as a "Greengrocer's Assistant". The 1911 edition of Kelly's Directory of Sussex lists Edward Austin as a "Stationer" at 11 Westbourne Place, Hove. Kelly's trade directories show that Edward Austin was in business as a "Stationer" at 11 Westbourne Place, Hove up until at least 1922. In 1924, at the age of 40, Edward Austin married Ethel Ruth Trigwell (born 1897, Lewes, Sussex), the daughter of Eliza and Joseph Trigwell, a brewery cellarman. Edward Austin fathered two children - Douglas Austin (born 1924) and Edward Ralph Austin (born 1926). Edward Austin died in Hove in 1955 at the age of 72. [ABOVE] A cabinet portrait of a young child sitting on a fur rug, photographed by either Ernest Austin or his younger brother Edward Austin at their studio at 42 Cowper Street, Hove (c1905). The photographer's credit is given as "E. Austin" and so the owner of the portrait studio at 42 Cowper Street, Hove, could either be Ernest Austin (1878-1909) or his brother Edward Austin (1883-1955). Both brothers were professional photographers. According to Rendel Williams of Sussex Postcards, Edward Austin worked for many years with James Williamson (1855-1933), a chemist and supplier of photographic materials at 55 Western Road, Hove. Rendel Williams reports that from 1906, Edward Austin published photographic postcards from his stationery business in Westbourne Place, Hove. Edward Austin's photographic postcards carry the initials "E. A.". This suggests that the photographic portrait studio at 42 Cowper Street, Hove, was probably operated by Ernest Austin. Henry Bate was born in Fitzroy Square, Marylebone, London, in 1863, the youngest son of Elizabeth Stapleton and Samuel Bate, an engineer, tool-maker and gunsmith from Devon. 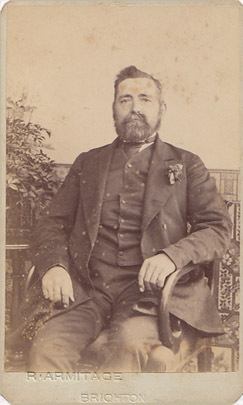 Samuel Bate, Henry's father, had been born in 1831 in the Devonshire parish of Werrington (now in the county of Cornwall). In 1855, Samuel Bate married Elizabeth Stapleton (born c1832, Week St Mary, Poundstock, Devon/Cornwall), This union produced at least 4 children: Thomas Stapleton Bate (born 1856, Woodley, Devon), William James Bate (born 1858, Holsworthy, Devon), Elizabeth Ann Bate (born 1859, Holsworthy, Devon) and Henry Bate (born 1863, Marylebone, London). By 1871, Samuel Bate and his family were living in the Essex village of Heybridge on the outskirts of Maldon. The 1871 census records Samuel Bate as a 39 year old "Engineer, Tools Maker" at No.9 Stock Terrace, Heybridge. Samuel Bate's eldest son, 14 year old Thomas S. Bate was also working as an 'engineer tool maker', but his three youngest children, including 7 year old Henry Bate, were still at school. When the census was taken 10 years later, Samuel Bate and his family were residing in the Essex town of Maldon, where he had established a gun-making business in the market town's High Street. In 1881, seventeen year old Henry Bate was employed as an assistant in his father's gunsmith's shop in Maldon's High Street. Henry Bate followed his father into the gun-making business and when Samuel Bate died in 1888, at the age of 56, Henry Bate took over his father's workshop in the Essex town of Maldon. At the time of the 1891 census, Henry Bate was recorded as a "Gun & Bicycle Maker" at 11 Market Hill, Maldon, Essex. Two years later, Henry Bate married Sarah Annie Barbara Chappell (born 1871,Edmonton, Middlesex), the daughter of Mrs Sarah Chappell of Edmonton. [ The marriage of Henry Bate and Sarah Annie Chappell was registered in the Essex district of Epping during the 3rd Quarter of 1893]. Henry Bate's wife Sarah (known as "Annie") gave birth to two children - Elsie Gladys Bate (born 1894, Maldon, Essex) and Aubrey Claude Bate (born 1896, Maldon, Essex) before she moved down to Hove in Sussex with her husband around 1900. 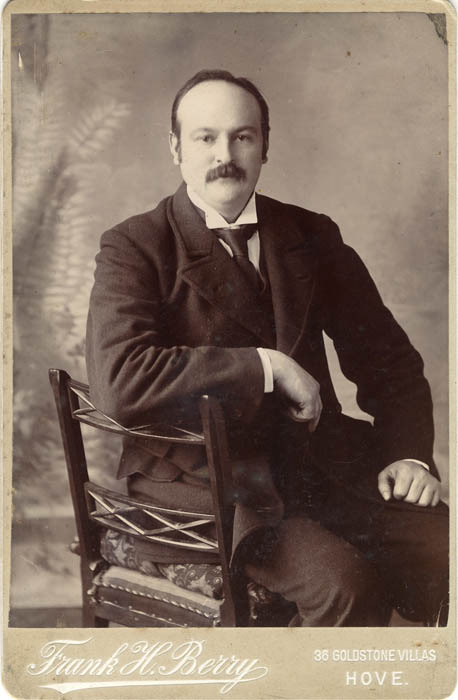 In 1900, Henry Bate entered into a business partnership with the photographer John Weaver Innes (1862-1928) who had for the last year or so been operating a photographic portrait studio at 36 Goldstone Villas, Hove, Sussex. 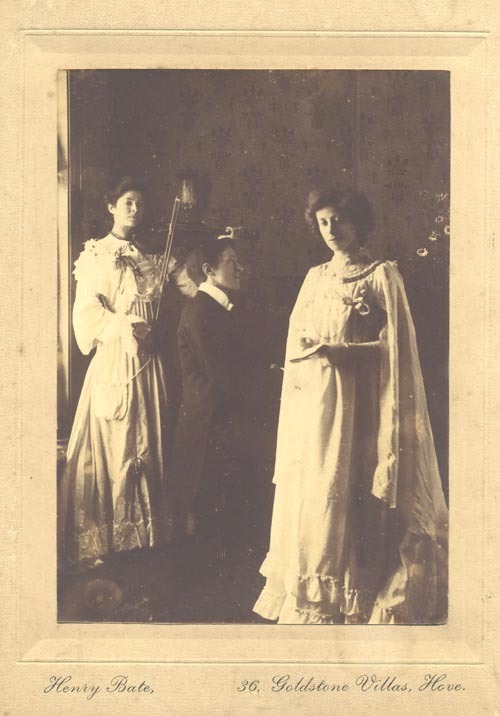 Photographic portraits produced at the Goldstone Villas studio during the first few months of 1901 carried the trade plate of Innes & Bate, but, by early Spring, the partnership between John Weaver Innes and Henry Bate had come to an end. A notice in The London Gazette published on 31st May 1901 announced that the firm of Innes & Bate, photographers at Hove, had been dissolved by mutual consent on 25th March 1901. The photographic business at 36 Goldstone Villas, Hove was retained by Henry Bate, who remained in business as a photographer at the Goldstone Villas studio until the outbreak of the First World War. Today, Henry Bate is more well-known for the magical apparatus and conjuring props he made for the magician and illusionist David Devant than for the photographic portraits he produced at his Goldstone Villas studio. Henry Bate's name appears in books on the history of magic acts and in articles on conjuring tricks produced during his lifetime. In his book "This is Magic: Secrets of the Conjurer's Craft", William Thomas Pritchard refers to "Henry Bate of Brighton (sic), that famous builder of magical properties". In 1924, The Strand Magazine published an article entitled "How Conjuring Tricks are Invented", which featured "an interview with Mr. Henry Bate". The interviewer explained that "although the name of Mr. Henry Bate is unknown to the general public, he is one of the most active members of that exclusive body known as the Inner Magic Circle". Edwin A. Dawes, an authority on the history of magic, described Henry Bate as "a leading 'back-room' man of magic". Between 1902 and 1914, Henry Bate operated a photographic studio at 36 Goldstone Villas, Hove, while managing to manufacture magic apparatus for David Devant, the leading magician and illusionist of his day. (David Devant was also the first President of the Magic Circle). In 1911, Henry Bate declared on the census form that he was a "Photographer" working on his "own account" at his home address of 36 Goldstone Villas, Hove. Sharing his home in Goldstone Villas was his 39 year old wife "Annie" (Mrs Sarah Annie Bate), his two children - Edith, a 16 year old "Civil Service Student" and Aubrey, a 14 year old school boy - Elizabeth Bate, his older unmarried sister, and a 26 year old servant Marion Webb, who is described as a "Mother's help". I have found very few photographic portraits taken by Henry Bate at his Goldstone Villas studio. Fortunately, a family archive has at least 3 photographs taken by Henry Bate of Hove. Alfred Walter Fisher (1874-1947) was a "Professor of Music", church organist and pianist who performed musical concerts in Hove during the early decades of the 20th Century. On 4th August 1901, Alfred Walter Fisher married Margaret Evans Binstead (1876-1955), a young woman who shared Alfred's musical interests. After his marriage, Alfred Walter Fisher returned to Hove, where he established The Hove Academy of Music. Around 1905, Alfred Walter Fisher and his wife Mrs Margaret Fisher both had their portraits taken at Henry Bate's photographic studio at 36 Goldstone Villas, Hove. During the same period, Henry Bate photographed Margaret and Alfred Fisher giving a musical performance, with Alfred at the piano and Margaret in the role of vocalist. Standing behind Alfred Fisher in the photograph is a young woman playing the violin. The female violinist could possibly be Ethel Binstead (born 1872, Worthing), Margaret's elder sister, who for a period of time lived with Alfred and Margaret Fisher. Henry Bate is last recorded as a professional photographer in 1913. When the 1915 edition of Kelly's Directory of Sussex was compiled, Henry Bate is still listed as the householder at 36 Goldstone Villas, Hove in the street directory, but he is no longer listed as a professional photographer at this address in the commercial section of the 1915 directory and does not reappear in subsequent editions. Henry Bate died in February or March 1944 at the age of 80. 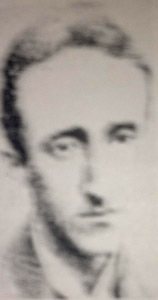 Contemporary newspapers and journals reported that Henry Bate had died at his home in Hove, yet his death was registered in the West Sussex district of Worthing during the First Quarter of 1944. [ABOVE] The announcement of the dissolution of the business partnership between John Weaver Innes and Henry Bate "carrying on business as Photographers at Hove, in the county of Sussex, under the style or firm of Innes and Bate", as published in The London Gazette on 31st May 1901. John Weaver Innes had been joined by photographer Henry Bate (born 1863, London) at 36 Goldstone Villas, Hove, at the end of 1900. The partnership of Innes & Bates was dissolved by mutual consent on 25th March 1901. The studio at 36 Goldstone Villas, Hove, remained in the hands of Henry Bate until about 1914. 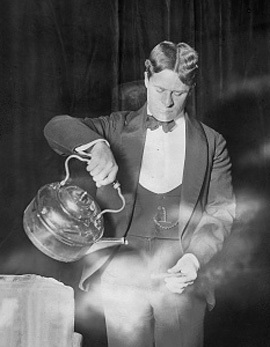 [ABOVE] The famous magician David Devant (1868-1941) lighting a cigar by pouring hot water over it with his 'Magic Kettle'. (Photographed at The Palace Theatre, London around 1904). The "Magical Kettle" was an illusionist prop made by Henry Bate, Hove photographer and 'manufacturer of conjuring tricks'. Henry Bate made a number of magical devices for Devant, including "The Henry Bate Coin Wand" and the "Bottomless Tub". 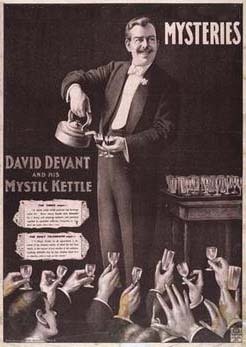 [ABOVE] A poster advertising "David Devant and his Mystic Kettle". The "Mystic Kettle" was made by Henry Bate (1863-1944) for the famous magician and illusionist David Devant. In his autobiography, Devant remarked: "With this innocent-looking receptacle I could supply my audience with any drink they wished, from water to cr�me de menthe". 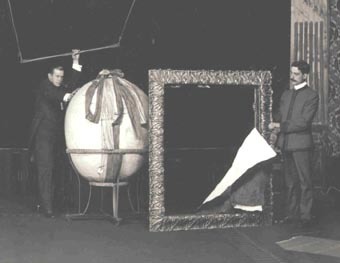 Bate manufactured many 'magic props' for Devant. 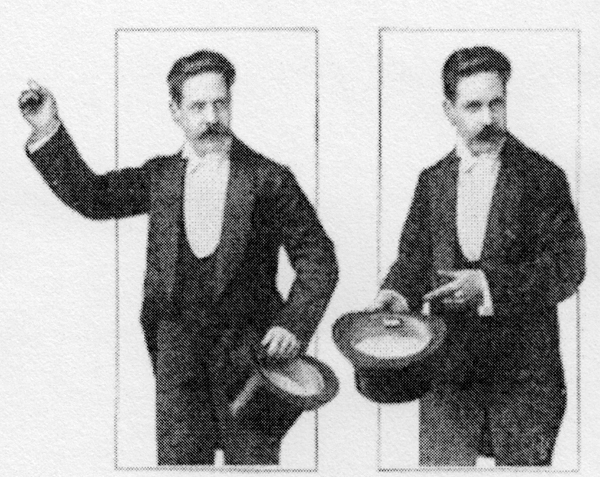 [ABOVE] The magician and illusionist David Devant (1868-1941), on the left, performing his "Giant's Breakfast" act . The man with the moustache standing on the right holding the picture frame could be Henry Bate (1863-1944), the 'magician's mechanic' who made most of David Devant's apparatus. In his autobiography, My Magic Life, David Devant mentions that Henry Bate bore a physical resemblance to Nevil Maskelyne (1863-1924), a British stage magician and inventor. Mr Maskelyne was around the same age as Henry Bate and also sported a bushy moustache. Are these portraits of the conjuror and photographer Henry Bate? In December 1904, The London Magazine published an illustrated article entitled "Conjuring at Home: Everyone his own Professor of Legerdemain". The author of the article acknowledged the contribution of the Hove photographer Henry Bate with this footnote: "We are indebted to the courtesy of Mr. Henry Bate of Hove, Sussex, who has had many years' experience as a practical conjurer and manufacturer of conjurers' requisites, for facilities for obtaining the information and photographs contained in this article". [ABOVE] Trade plate of Henry Bate, photographer of 36 Goldstone Villas, Hove. [ABOVE] Square format studio portrait of Mrs Margaret Evans Fisher [formerly Binstead] (1876-1955), photographed by Henry Bate of 36 Goldstone Villas, Hove (c1905). Margaret Evans Binstead was born in Worthing in 1876, the youngest daughter of Emma Heryett and James Binstead, a market gardener, fruiterer, greengrocer and general shopkeeper. On 4th August 1901, at St Botolph's Church, Heene, near Worthing, Margaret Evans Binstead married Alfred Walter Fisher (1874-1947), a music teacher who was based in Hove, Sussex. [ABOVE] Square format studio portrait of Alfred Walter Fisher (1874-1947), photographed by Henry Bate of 36 Goldstone Villas, Hove (c1905). Alfred Walter Fisher was born in Folkestone, Kent, in 1874, the youngest son of Theoclea Theobald and Frederick Fisher, a boot and shoe manufacturer. By March, 1901, Alfred Walter Fisher was residing in Hove and in the census of that year he is recorded as twenty-six year old "Professor of Music". On 4th August 1901, Alfred Walter Fisher married Margaret Evans Binstead. (See photo opposite). [ABOVE] Henry Bate's photograph of Alfred Walter Fisher and his wife Margaret Evans Fisher giving a musical performance, with Alfred at the piano and Margaret in the role of vocalist. Standing behind Alfred Fisher in the photograph is a young woman playing the violin. The female violinist could possibly be Ethel Binstead (born 1872, Worthing), Margaret's elder sister who lived with Alfred and Margaret Fisher at 93 Church Road, Hove and is known to have given musical recitals. Alfred Walter Fisher was born in Folkestone, Kent, in 1874, the youngest son of Theoclea Theobald (1839-1890) and Frederick Fisher (1839-1928), a boot and shoe manufacturer. In 1895, at the age of 21, Alfred Walter Fisher passed the Royal Academy of Music's Metropolitan Examination qualifying him as a Teacher of Pianoforte. (The Musical Times, 1st February, 1895, No. 624, Vol.36 and Musical News, Vol. 8, page 57, 1895). The following year, Alfred Fisher was giving piano recitals in Worthing. By the late 1890s, Alfred Fisher was the Organist at the Christchurch Road Baptist Church in Worthing. It was possibly during his tenure at the Worthing Baptist Church that he made the acquaintance of Margaret Evans Binstead (born 1876, Worthing), the youngest daughter of James Binstead, a widowed jobbing gardener living in the Heene district of Worthing. At the time of the 1901 census, Alfred Walter Fisher was boarding at Mrs Caroline Martin's lodging house at 38 Walsingham Road, Aldrington, Hove, Sussex. On the census return Alfred W. Fisher is recorded as twenty-six year old "Professor of Music". On 4th August 1901, Alfred Walter Fisher married Margaret Evans Binstead at St Botolph's Church, Heene, near Worthing. The couple settled in Hove, Sussex, where their first child, a son named Leslie Elgar Fisher, was born on 9th December 1904. 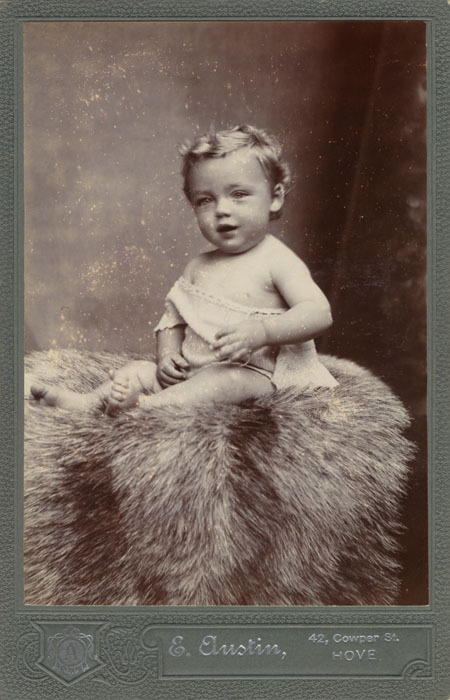 A second son, Bernard Morris Fisher, was born in the Aldrington district of Hove three years later. [Birth registered in the Sussex district of Steyning during the First Quarter of 1908]. A third son, Adrian Michael Fisher was born in Hove on 15th March, 1917. When the census was taken on 2nd April 1911, Alfred Walter Fisher and his family were recorded at 93 Church Road, Hove, Sussex. On the 1911 census form, 36 year old Alfred Fisher gave his occupation as "Musical Performer & Professor, Pianist, Organist & Composer" and "Principal of Hove Academy of Music". It appears that Alfred Walter Fisher established The Hove Academy of Music around 1904. According to Judy Middleton, Alfred Fisher founded The Hove Academy of Music at 22 Church Road, Hove. Around 1911, Alfred Fisher moved his music academy to 93 Church Road, Hove. 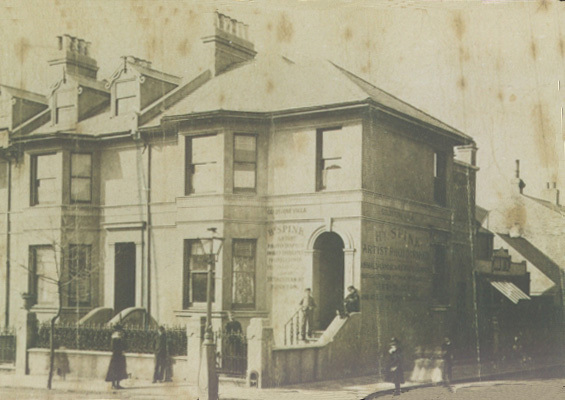 The Hove Academy of Music was still based at 93 Church Road, Hove, in 1923. As well teaching at the Hove Academy of Music, Alfred Fisher put on orchestral concerts and musical entertainments and organized music festivals. There is also evidence that Alfred Fisher was a prolific composer. In 1904, The Monthly Musical Record reported on a concert which included "a pianoforte trio and songs by Mr. A. W. Fisher, organist". A 1907 issue of The Musical Herald referred to "original and instrumental vocal compositions" by Mr. A. W. Fisher. 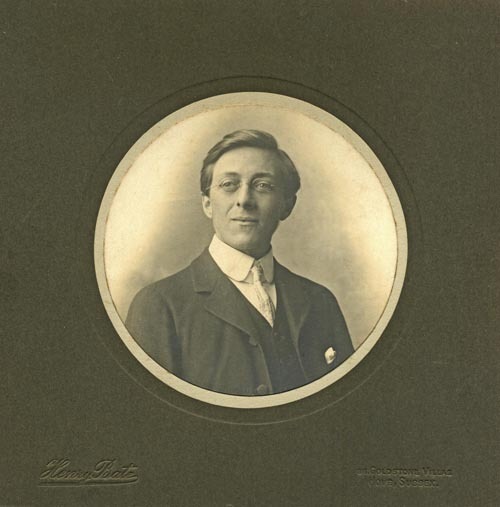 In January 1915, Alfred W. Fisher published a patriotic song entitled "Shall Britain Call in Vain". ("Song, words and music" by A. W. Fisher). Alfred's eldest son, Leslie Elgar Fisher won an open scholarship at the Hove Academy of Music in 1913 and went on to become a composer in his own right (Suite in D major). Alfred Walter Fisher died in Hove, Sussex, in 1947 at the age of 73. I am very grateful to Carol B. Smith Fisher for allowing me to feature family photographs taken by Henry Bate of 36 Goldstone Villas, Hove. [ABOVE] The trade plate of photographer Frank Houghton Berry taken from the foot of a cabinet portrait produced at 36 Goldstone Villas, Hove (c1898). Frank Houghton Berry was born in Brighton in 1852, the son of Mary Houghton and John Charles Berry, a printer, bookseller and stationer. Frank's father, John Charles Berry, had been born in Chertsey, Surrey, on 16th May 1820, the son of Sarah and Daniel Berry. On 15th August 1846, at Christ Church, Southwark, in South London, John Charles Berry married Mary Houghton (born c1815, St Columb Major, Cornwall). Shortly after their marriage, the couple settled in Brighton, where all four of their children were born - George Walter Houghton Berry (born 1847), Mary Houghton Berry (born 1849), Frank Houghton Berry (born 1852) and Catharine Houghton Berry (born 1854). By 1858, John Charles Berry had established himself up as a printer, bookseller and stationer at 26 St James Street, Brighton, in the Kemp Town district of the town. John Charles Berry is recorded as a bookseller and stationer in Brighton's St James Street throughout the 1860s, but the business came to an end when Frank's father died in 1869 at the age of 48. After the death of her husband, Mrs Mary Berry set up a lodging house in Brighton's King's Road. The 1871 census records Mrs Mary Berry, a fifty-six year old widow, as a lodging house keeper at 48 King's Road Brighton. Mrs Berry's teenage son, Frank Berry, had already begun his career as a professional photographer. The 1871 census records Frank Berry as a nineteen year old "Photographic Artist" residing with his widowed mother at her Brighton lodging house. By the end of the decade, Frank Berry and his mother had left Brighton and relocated to the London area. In 1880, Frank Houghton Berry married Esther Blanche Walker (born 1854, Westminster, London), the daughter of Martha Matilda Palmer and Charles Walker, a London police inspector. Charles Walker (born c1821 London) had married Martha Matilda Palmer (born c1822 London) at All Souls Church in the London district of Marylebone on 8th January 1844. Charles and Martha Walker produced a large number of children, ten of whom reached adulthood. Esther Blanche Walker was the second eldest of seven daughters fathered by Police Inspector Charles Walker. When the 1881 census was taken, Frank Houghton Berry was living with his wife at 25 Essex Road, off Horn Lane, in the London suburb of Acton. On the census return, Frank H. Berry is described as a twenty-nine year old "Photographic Artist". Residing a few doors away at 21 Essex Road, Horn Lane, Acton, was Frank Berry's widowed mother, sixty-six year old Mrs Mary Berry and his younger unmarried sister twenty-six year old Catharine Houghton Berry. As Mrs Berry's eldest surviving son (her first-born son George Walter Houghton Berry had died in Chertsey, Surrey, in 1872 at the age of 24), Frank Berry was probably supporting his mother and sister financially at this time. It appears that Esther Berry, Frank Berry's wife, gave birth to a daughter later that year, but the little girl died in 1883, when she was only 2 years of age. During the 2nd Quarter of 1883, when the Berry Family were still living in Acton, Frank's wife Esther gave birth to a second child, a daughter named Evelyn Maude Houghton Berry. A third daughter, Florence Edith Berry was born in Acton during the 4th Quarter of 1884. By 1888, Frank Houghton Berry and his family were living in the Shepherds Bush area of West London. Frank Berry's son Vivian Houghton Berry was born in Shepherds Bush during the 3rd Quarter of 1888. [ABOVE] A cabinet portrait of a man with a luxuriant moustache, photographed by Frank Houghton Berry of 36 Goldstone Villas, Hove (c1898). In the early 1890s Frank Houghton Berry operated a photographic studio with a young London photographer named James Ledgett Sharp (born 1868, Rotherhithe, South London). [ABOVE] The announcement of the dissolution of the business partnership between Frank Houghton Berry and James Sharp, "Photographic Artists at 16 and 17 Poultry, in the City of London" on 21st July 1892, as published in The London Gazette on 2nd August 1892. [ABOVE] A carte-de-visite portrait of an unknown man photographed at the studio of Berry & Sharp at 16 & 17 Poultry, Cheapside, London, E.C. (1892). The partners in the photographic firm of Berry & Sharp were Frank Houghton Berry (1852-1923) and James Ledgett Sharp (born 1868, Rotherhithe). When the census was taken on 5th April 1891, Frank Houghton Berry and his young family were living in Dulwich district of South London. The 1891 census records Frank and Esther Berry and two of their young children at 56 Glengarry Road, Camberwell, near Dulwich railway station. On the 1891 census return, Frank H. Berry is described as an ('employed') "Photographic Artist", aged 39. There is a suggestion that around this time Frank Berry was employed as a photographer by Henry Coppin, who owned a photographic portrait studio at 16 & 17 Poultry, City of London. In the early 1890s, Frank Houghton Berry entered into a business partnership with a young London photographer James Ledgett Sharp (born 1868, Rotherhithe, South London). By the end of 1891, the photographic studio at 16 & 17 Poultry, City of London carried the name of Berry & Sharp. However, the partnership between Frank Berry and James Sharp lasted only for a year or so. On 2nd August 1892, The London Gazette published a notice announcing the dissolution of the business partnership between Frank Houghton Berry and James Sharp, previously "carrying on the trade or business of Photographic Artists at 16 and 17 Poultry, in the city of London". The partnership of Berry and Sharp was dissolved "by mutual consent" on 21st July 1892, the business being carried on by James Sharp, who took on "all debts due to and from the said Partnership". James Sharp continued as a photographer at 16 & 17 Poultry, City of London until 1893, when the studio became the Mansion House Photographic Company under the management of William George Plowright. Towards the end of 1893, Frank Berry's wife Esther died at the age of 38. [The death of Esther Blanche Berry was registered in the South London district of Camberwell during the 4th Quarter of 1893]. Frank Houghton Berry was left a widower with three children under the age of 10 to care for and support. Assistance was provided by Frank Berry's mother-in-law Mrs Martha Walker (c1822-1901) and two of her unmarried daughters, Adelaide Alexandra Walker (born 1864, Westminster) and Louisa Alberta Walker (born 1867, Westminster). Around 1897, Frank Houghton Berry returned to Sussex to pursue his photographic career. It appears that Frank Berry set himself up as a portrait photographer in Hove, but his first venture was not successful. A trade directory published in 1898, but compiled during the previous year, records Frank H. Berry as a photographer at 48 Coleridge Street, Hove. On 1st November 1897, at a County Court hearing, Frank Houghton Berry, a photographer of Hove, was recorded with debts of �20 9s 8d. It was around the time of the County Court judgement in 1897 that Frank Berry made contact with Mrs Sarah Spink, the widow of photographer Henry Joseph Spink (1838-1892). 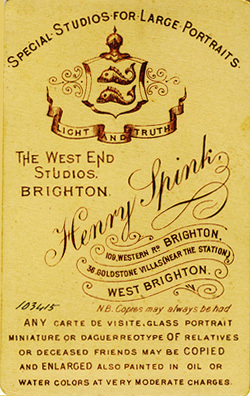 For a quarter of a century, Henry Joseph Spink had been one of the leading photographers in Brighton and Hove, operating studios at 109 Western Road, Brighton and, since 1878, at 36 Goldstone Villas, Cliftonville( now part of Hove). 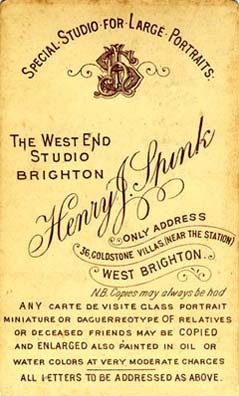 From around 1890, Spink's Brighton studio in Western Road was run by his son Henry Spink junior(1865-1943), with the Goldstone Villas studio remaining under the control of Henry Joseph Spink After Henry Joseph Spink died on 23rd May 1892, at the age of 53, Henry J. Spink's studio at 36 Goldstone Villas, West Brighton (Hove), was initially managed by his youngest son Samuel George Spink, but when Samuel and his family returned to Australia, the studio passed to Henry Spink's widow, Mrs Sarah Spink (1839-1899). [ABOVE] A photograph of Henry Joseph Spink's house and studio at 36 Goldstone Villas, Cliftonville, taken around 1878. Mrs Sarah Spink, the photographer's wife, stands at the gate. [ABOVE] The trade plate of Henry Spink, 109 Western Road Brighton and 36 Goldstone Villas, near the station, West Brighton. (c1888). [ABOVE] The trade plate of Henry Joseph Spink, 36 Goldstone Villas, near the station, West Brighton (c1890). In Towner's 1896 Directory of Brighton & Hove, Mrs Sarah Spink, Henry Spink's widow, is listed as a photographer at 36 Goldstone Villas, Hove. It appears that from around 1897, Mrs Spink recruited Frank Houghton Berry to run her studio in Goldstone Villas. Although Mrs Sarah Spink probably retained ownership of the studio, from 1897 the studio was listed under the name of Frank H. Berry. Frank Houghton Berry is first recorded as a photographer at 36 Goldstone Villas, Hove in the 1897 edition of Pike's Directory of Brighton & Hove. Interestingly, in the Street Directories published around this time, the name of Frank H. Berry appears alongside the name of Henry Joseph Spink (Mrs Sarah Spink) at 36 Goldstone Villas, Hove. It appears that Frank Berry continued to reside at 48 Coleridge Street, Hove, during his time at the Goldstone Villas studio. (Frank H. Berry is listed as the occupant of 48 Coleridge Street, Hove in the 1898 editions of both Kelly's Sussex Directory and Towner's Directory of Brighton & Hove). Frank Houghton Berry is recorded as a photographer at 36 Goldstone Villas, Hove for just two years, between 1897 and 1899. When Frank Houghton Berry arrived in Hove in 1897, he was a forty-five year old widower with three children under the age of sixteen - Evelyn Maude (aged 14), Florence Edith (aged 13) and Vivian Frank Berry (aged 9). It seems that after the death of Mrs Esther Berry in 1893, Frank Berry had become close to his late wife's sisters, Adelaide Alexandra Walker (born 1864, Westminster) and Louisa Alberta Walker (born 1867, Westminster). Towards the end of 1898, at Hove, Frank Berry married his thirty-four year old sister-in-law Adelaide Walker. [The marriage of Frank Houghton Berry and Adelaide Alexandra Walker was registered in the Sussex district of Steyning (which embraced Hove) during the 4th Quarter of 1898]. Presumably, Frank Berry, his new wife Adelaide, and the three children from his first marriage, made their home at 48 Coleridge Street, Hove. During the final quarter of 1899, a year after their marriage, Frank and Adelaide Berry became the parents of a baby daughter named Violet Medeline Berry. [The birth of Violet Medeline Berry was registered in the Sussex district of Steyning during the 4th Quarter of 1898]. With the death of Mrs Sarah Spink, the owner of the Goldstone Villas studio, in 1899, the special arrangement between Mrs Spink and Frank Berry came to an end. The photographic studio at 36 Goldstone Villas, Hove was eventually sold to John Weaver Innes (born c1862, Hackney, London) and his business partner Henry Bate (born 1863, Marylebone, London). After the dissolution of the firm of Innes & Bate, the studio at 36 Goldstone Villas, Hove was retained by Henry Bate, who operated as a photographer from the Goldstone Villas address until the outbreak of the First World War. [ABOVE] The trade plate of Frank Houghton Berry, Photographic Artist of 36 Goldstone Villas, Hove, rubber-stamped on the reverse of a carte-de-visite portrait (c1897). [ABOVE] A carte-de-visite portrait of a young woman photographed by Frank Houghton Berry of 36 Goldstone Villas, Hove (c1897). [ABOVE] An extract from the listing of occupants of the buildings in Goldstone Villas, Hove, which appeared in the Brighton & Hove Street Directory section of Kelly's Directory of Sussex, published in 1899. Frank H. Berry is listed as a photographer at 36 Goldstone Villas, Hove, but the name of Henry Joseph Spink is still shown alongside Frank Berry at No.36. This suggests that Mrs Sarah Spink, the widow of Henry Joseph Spink, retained ownership of the photographic portrait studio at 36 Goldstone Villas, Hove. [ABOVE] A cabinet portrait of a man seated on a chair, photographed by Frank Houghton Berry of 36 Goldstone Villas, Hove (c1898). [ABOVE] A photograph of Henry Joseph Spink's house and studio at 36 Goldstone Villas, Cliftonville, taken around 1878. Mrs Sarah Spink, the photographer's wife, stands at the gate. The building, the walls of which are covered with the photographer's publicity, stands on a corner at the junction between Goldstone Villas and Shirley Street. 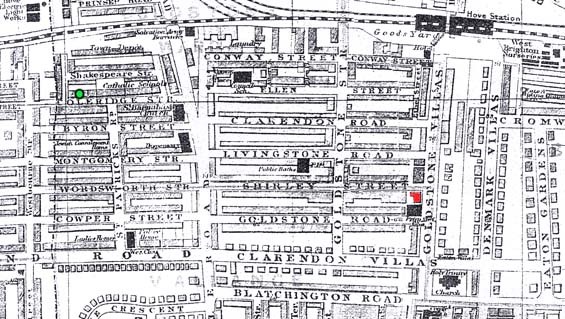 [ABOVE] A late Victorian map showing the location of the photographic studio at 36 Goldstone Villas, Hove (marked in red), where photographer Frank Houghton Berry was based between 1897 and 1899. Frank H. Berry's home was at 48 Coleridge Street, Hove (marked in green). Hove Railway Station (top right-hand corner of the map), was within walking distance of Frank Berry's home and studio. [ABOVE] A recent photograph of 36 Goldstone Villas, Hove (2005). This building was used continuously as a photographic portrait studio between 1878 and 1914. Originally owned by Henry Joseph Spink, the Goldstone Villa studio was taken over by Frank Houghton Berry around 1897. The studio was sold to John Weaver Innes and Henry Bate in 1900. [ABOVE] An extract from the listing of occupants of the buildings in Goldstone Villas, Hove, which appeared in the Brighton & Hove Street Directory section of Kelly's Directory of Sussex, published in 1899. 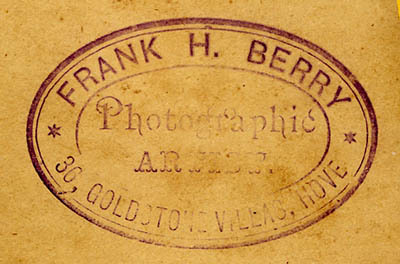 Frank H. Berry is listed as a photographer at 36 Goldstone Villas, Hove, but the name of the previous owner of the studio, Henry Joseph Spink, is still shown alongside Frank Berry at No.36. After his studio in Hove was sold in 1900, Frank Houghton Berry secured a position as a studio manager in Walthamstow, a north-eastern suburb of London, which was then part of Essex, but now lies within the London Borough of Waltham Forest. The name of the photographic studio was Takewhel & Pretti, which appears to be a play on the words Take Well" and "Pretty". Takewhel & Pretti were based at two studios, one at 163 Hoe Street, Walthamstow (managed by Frank Berry) and the other at 855 Romford Road, Manor Park in East London. The Takewhel & Pretti studios were owned by Joseph Pettingall (born 1867, Shoreditch, London). The 1901 census records Frank Houghton Berry and his family residing in the living quarters attached to a photographic portrait studio at 163 Hoe Street, Walthamstow. On the census return, forty-nine year old Frank H. Berry is described as a "Photographer's Manager". Sharing the apartment at 163 Hoe Street, Walthamstow. was thirty-six year old Adelaide Berry, Frank's second wife, two children from his first marriage, his daughter Florence and twelve year old son Vivian Frank Berry, plus two year old Violet, the daughter he had fathered with his second wife. Frank Berry's sixteen year old daughter Florence Edith Berry (born 1884, Acton, Middlesex) was employed as a "Photographer's Receptionist" at Takewhel & Pretti's Walthamstow branch studio. 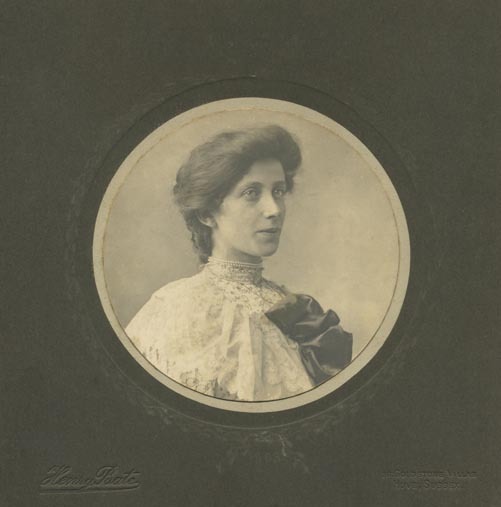 Frank Berry's eldest daughter Evelyn Maude Berry (born 1883, Acton, Middlesex) was living away from home in Battersea, London, where she was working as a photographer. On the 1901 census return, Evelyn M. Berry is recorded as a "Photographer", aged 17, residing at a house called "Corve Dale" in Boundaries Road, Balham, London SW.
By 1911, Frank Houghton Berry had left the employment of Takewhel & Pretti and was working as a photographer in West London. At the time of the 1911 census, Frank Houghton Berry was residing at 38 Aylmer Road, off Wendell Road, North Hammersmith, London W12 with his wife Adelaide and their twelve year old daughter Violet Madeline Berry. 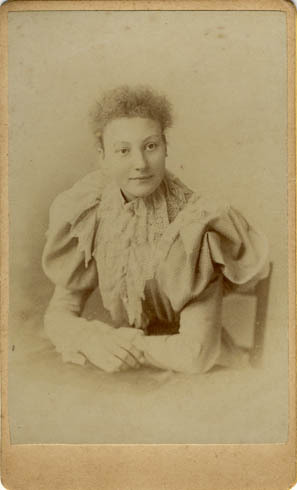 Although two of Frank Berry's daughters were employed in the business of photography - Florence Berry (born 1884, Acton, Middlesex) working as a "Photographer's Receptionist" in her teenage years and Evelyn Berry (born 1883, Acton, Middlesex) earning her living as a photographer in London in 1901 - his only son Vivian Frank Berry chose a career in the Royal Navy. The 1911 census, records twenty year old Vivian Frank Houghton Berry serving overseas in the Royal Navy. Vivian Berry survived the First World War to marry Isobel F. Tingle in Hammersmith in 1922. Frank Houghton Berry died in the London district of Wandsworth in 1923 at the age of 71. [The death of Frank Houghton Berry was registered in the district of Wandsworth during the 3rd Quarter of 1893]. [ABOVE] Hoe Street, Walthamstow pictured in 1903. Frank Houghton Berry and his family were living at 163 Hoe Street, Walthamstow at the time of the 1901 census. 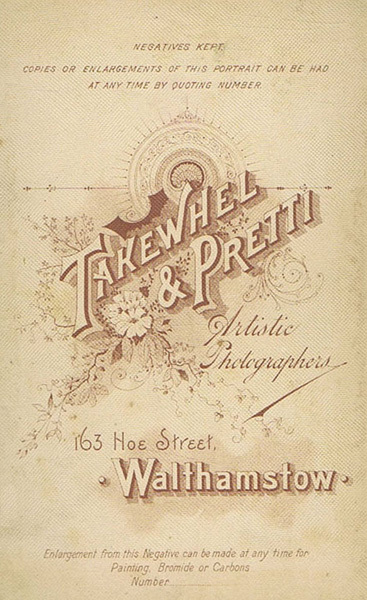 [ABOVE] Takewhel & Pretti , a firm of photographers listed at 163 Hoe Street, Walthamstow, in Kelly's London Suburban Directory for 1901. At the time of the 1901 census, Frank Houghton Berry was recorded as a "Photographer's Manager" at 163 Hoe Street, Walthamstow. 'Takewhel & Pritti' was the trading name of the photographer Joseph Pettingall (born 1867, Shoreditch, London - died 1953, district of Walthamstow, Essex). 'Takewhel & Pretti', the name of the photographic studio was was probably a play on words which were appropriate for the activity of portrait photography (i.e. "take well" and "pretty"). There are no proper surnames which correspond to 'Takewhel' or 'Pretti'. In the early 1900s, Joseph Pettingall owned two photographic portrait studios which traded under the name of 'Takewhel & Pretti', one at 163 Hoe Street, Walthamstow, Essex, and the other at 855 Romford Road, Manor Park in East London. There is evidence that Joseph Pettingall owned a third photographic portrait studio at 7 The Parade, Chingford, Essex. Around 1900, Frank Houghton Berry (1852-1923) secured the position of Studio Manager at the 'Takewhel & Pretti' photographic studio at 163 Hoe Street, Walthamstow, Essex. The 1901 census records Frank Houghton Berry, described as a 49 year old "Photographer's Manager", residing with his wife and childre in the living quarters attached to the photographic portrait studio at 163 Hoe Street, Walthamstow. Frank Berry's sixteen year old daughter, Florence Edith Berry (born 1884, Acton, Middlesex), was employed as a "Photographer's Receptionist" at Takewhel & Pretti's Walthamstow studio. For a couple of years, the firm of 'Takewhel & Pretti' was apparently the official photographer to the Essex County Cricket Club. A copyright form completed on 24th May 1901 records the photographer Frank Berry as the author of a picture depicting the eleven members of the Essex County Cricket Team. A second group photograph of the Essex County Cricket Team taken by Frank Berry was registered for copyright on 28th May 1902. On the registration forms for both cricket team photographs, the copyright owner is named as Joseph Pettingall. On the first registration form, dated 24th May 1901, the 'copyright owner of the work' is given as "Joseph Pettingall, trading as Takewhel & Pretti of 163 Hoe Street, Walthamstow". The second form, which was completed on 24th May 1902, the 'copyright owner of the work' is given as "Joseph Pettingall, 7 The Parade, Chingford", while the 'copyright author of work' is named as "Frank Berry of 163 Hoe Street, Walthamstow, Manager to Joseph Pettingall". A third copyright registration form, dated 18th May 1903, regarding a photograph of an historic lace collar called 'The Star of Camden' names the 'copyright author of work' as "Frank Berry, c/o of Takewhel & Pretti, 163 Hoe Street, Walthomstow, Essex" so we know that Frank Berry was employed by Joseph Pettingall as a photographer and studio manager for at least 3 years. At the time of the 1901 census, Joseph Pettingall was residing with his wife and two children at The Parade, Chingford, Essex. On the census form, 34 year old Joseph Pettingall gives his occupation as "Photographer (Employer)". The birth details of his two children indicates that Joseph Pettingall had been residing in Chingford, Essex, since the Spring of 1895, so it is clear why he had to employ managers at his studios in Walthamstow and Manor Park. [ABOVE] The trade plate of Takewhel & Pretti , 'Artistic Photographers' of 163 Hoe Street, Walthamstow, taken from the reverse of a cabinet card portrait. Frank Houghton Berry, the Studio Manager and Chief Photographer at the Walthamstow branch of Takewhel & Pretti, appears to have specialised in studio portraits of children.